We had a lot of rain last evening. My phone was flashing me info about storms in the area, but there was no thunder so they must have been fairly far away. All the bulbs and seeds and tubers I planted got a really good soaking. I also made my pasta. I made a lot of pasta. I ran into 2 issues. The first is that the pasta maker needs to be clamped down and the clamp doesn't work with my counter. As a result I had to use the kitchen table, which meant sitting down. I'm a stander. I like to stand at the counter to do my prep and processing. I ended up doing the preliminary rolling at the counter, then going to the table, sitting down, and running the dough through the maker. 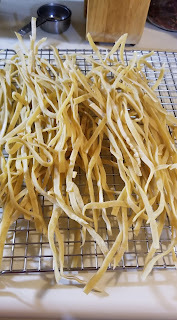 After that I had to get up and take the cut pasta back to the counter where I had the drying rack set up. Very inefficient. 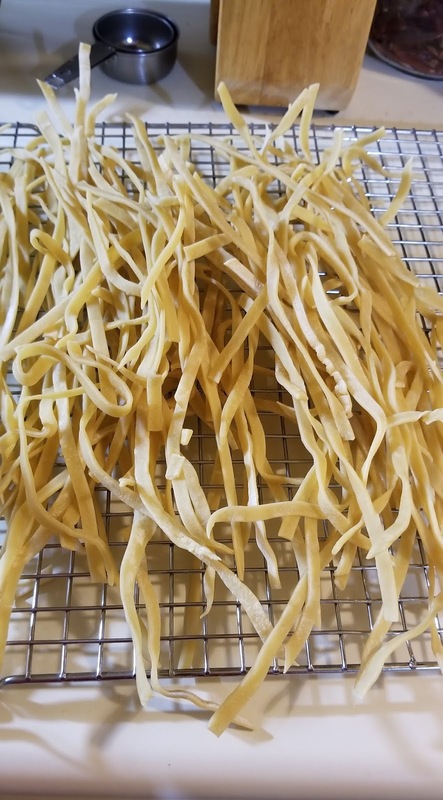 There are a number of pasta recipes out there, all of them using basically the same ingredients, flour and eggs, though with different quantities. None of them tell you how much pasta you're going to end up with, and that was the 2nd issue. I have a lot of pasta and I used what seemed like an average recipe. The drying rack I planned on using was filled in no time, so I started laying it out on sheets of wax paper - which only let it dry on one side. My pasta got moved a lot. The more I turned it over and moved it around, the more out of shape it got. As a result, my fettuccine is anything but straight, which I guess means I made gay fettuccine. One of those pasta drying trees is essential. And I saw yesterday the Idiot Jerk was thinking about sending those immigrants he hates so much to Sanctuary Cities. This man does not understand America, the land of the free, the home of the brave. He thinks America is all white and selfish like his MAGA heads. We are not. Oh, and evidently he told the Acting Director of Homeland Security that if he got in legal trouble by shutting down the borders, what the Idiot Jerk wants him to do, he will be pardoned. I almost laughed when I heard that... really, I did. The Idiot Jerk defines the Republican mindset. Gay Fettuccini! Your title certainly piqued my interest. Making pasta sounds like an ordeal! It really wasn't, I was more frustrated that I couldn't clamp the maker to the counter. But, now that I know I can't... I have a plan! While I like the "thought" of making pasta, actually doing it sounds like work, and I'm hungry now. It is a little work, but I will tell you, is a bell ringer. It's not gay fettuccine without the confetti! You're right! I should have made one of those little movies. Gay fettuccine! What a great name! You should start a pasta making business and name it that! If it hadn't got all curly, I wouldn't have thought of it. The pasta will be delish, I'm sure! As far as trump and his trumpers and GOP...Karma is just sharpening her nails and finishing her drink. She'll be with them all shortly. Maddie, you give good head visuals. Yes... I do like that... sharpening her nails and finishing her drink. gay pasta; what a novel (see what I did there?) idea!